Every day, all over the world, top professional chefs place their trust in highly reliable Spring USA products, knowing that outstanding cuisine is impossible without perfect kitchen equipment. Your cookware not only has to be high-quality and reliable, but has to look good too. 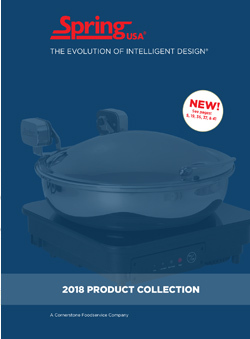 Spring USA cookware, chafing dishes and front-of-house cooking equipment are beautifully designed and perfectly finished. Each piece is made to be beautiful, durable and functional. Click on a category below to view the finest in Culinary Cookware, Induction, Buffet Systems, Tableware and more!